A live micro distillery and restaurant scheme for Swansea has been revealed in a project creating 40 new jobs. The redevelopment of 1 York Street is on the gateway to the £500m regeneration currently underway to link the city centre to the waterfront. 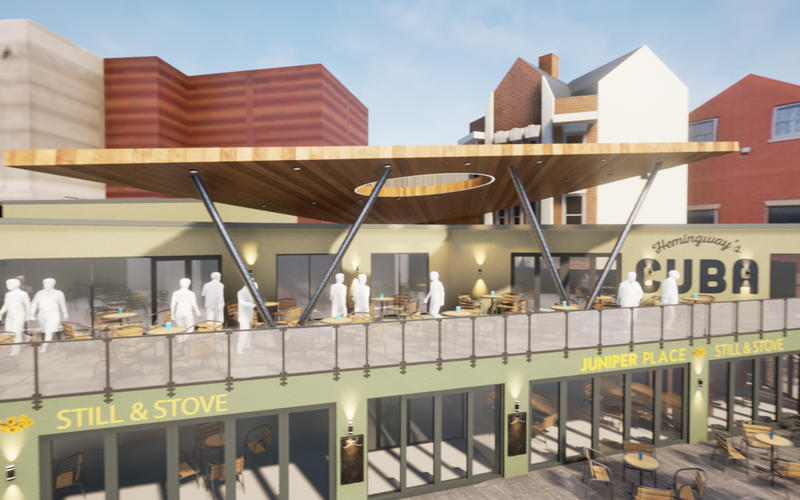 The ground floor will be home to ‘Juniper Place – Still & Stove’ – a 100 seat restaurant using only the best Welsh produce alongside Wales’ first live Micro-Distillery will ensure a one of a kind dining experience. Diners and passers by will see the distilling process actually take place. Juniper Place will be also the birthplace of Cygnet Spirits creating craft Gin and Rum on site. Whilst on the first floor, visitors will find ‘Hemingway’s Cuba – Rum bar and kitchen’ offering a true taste of Havana: Authentic Cuban cuisine washed down with delicious cocktails created by award winning mixologists. Both venues will be family friendly. The development is the brainchild of Cygnus Investments, owned by local businessmen David Bellis, David Wakely, Clive Atkins and David Atkins. Mr Bellis and Mr Wakely also own Li’l London on The Strand, as well as another bar and restaurant soon opening next door called Firefly — Martin Co. Mr Bellis said the original plan was to open these businesses on The Strand and then look elsewhere at other cities, but he said the £500 million city centre regeneration proposals for Swansea were an incentive to look no further. Mr Bellis said the company has had support from the local authority, grant funding from the Welsh Government, and was impressed by the City Deal proposed for the Swansea Bay City Region. “Once we understood the scale of the regeneration and the size of the investments that would be coming to the city, along with the unparalleled drive from the council, we decided there would be no place better to invest in, and concentrate our time and efforts on, than Swansea,” he said. If you’re planning a new development in Swansea City Centre, why not let iCreate present it in the context of everything else that’s happening across the city. We’ve modelled the vision for Swansea City Centre (watch the flythrough here). Just as we’ve done for this scheme by Cygnus Developments, we can add your upcoming sites to our model and provide bespoke presentation materials – flythroughs, CGIs and even virtual reality walkthroughs – for you and your business. Let us help you share your vision. Contact us to find out more.